A Whole Gaggle Of AGV Corsa Helmet Graphics! Get ahead of the competition while protecting yours with the new AGV Corsa. 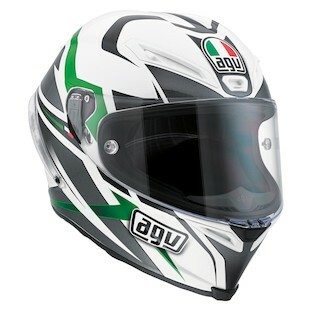 AGV recently released the Corsa helmet, a non-carbon fiber version of the Pista GP built with road-racing features in mind. 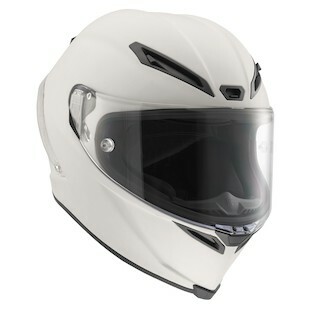 For more detailed technical information about the Corsa, please check out our separate post about the tech specs, but in a nutshell the Corsa is a composite shell construction helmet developed in conjunction with Valentino Rossi and has the shell shape, aerodynamics, and ventilation from the Pista GP helmet. The best part about the Corsa? The awesome graphics of course! 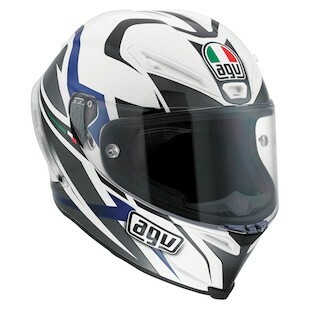 The AGV Corsa Velocity is a helmet built for maximum attack. The only way to go as fast as this helmet looks is to tuck in behind your screen and pin the throttle. The Velocity comes in a White and Black pattern with Blue, Green, or Red accents. 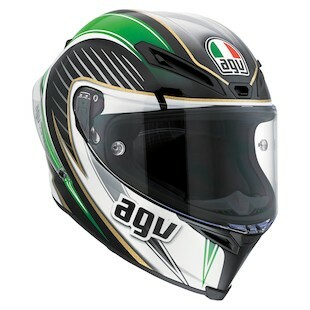 For any Italian espatriati, or devoted Ducatisti there is an AGV Corsa Velocity Italy (or should I say Velocità Italia) color scheme that is White and Black with Green accents on the right side and Red on the left. The AGV Corsa Racetrack makes no false pretensions about where this helmet belongs or what it was designed to do. The Racetrack was built for one thing and one thing only: smashing the competition at your circuit. This graphic has a similar Italian Green, White, and Red color scheme as the Velocity, but adds gold pinstriping to complement your 1st place trophy. 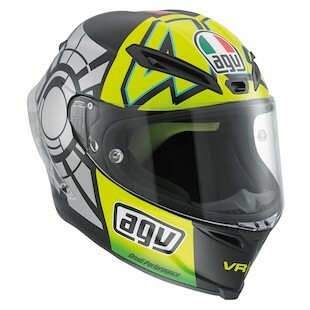 No AGV helmet line would be complete without a VR46 replica graphic. Well, the AGV Corsa has two designs to show off your status as a member of the Rossi fan club: the Sole Luna and the Winter Test LE. 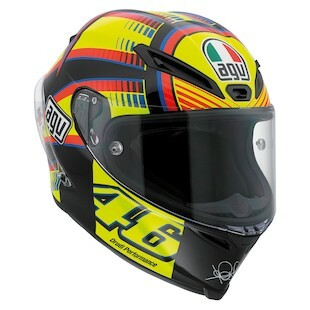 The AGV Corsa Sole Luna is the classic replica of the helmet most MotoGP racers see running away in front of them as Rossi screams past. This helmet graphic makes the fans in the stands go wild; it needs to be going fast! The AGV Corsa Winter Test LE graphic is a limited release design based on the helmet Il Dottore wore during pre-season testing of the Yamaha YZF-M1. Practice is the only way Valentino got as good as he is, and the Winter Test graphic is the perfect helmet to wear when sharpening your skills out on the track. One last graphic option for the AGV Corsa is the Primer. The Primer is not a typical helmet graphic since it is not actually painted. The AGV Corsa Primer ships with just the primer paint applied and is the perfect blank canvas for those who want a custom painted helmet design!